What to know before you plan a trip to the Kladruby monastery. Souvenirs can be purchased in the ticket office. Commemorative medals and stamps can be purchased in the ticket office. The main courtyard, the monastic garden and the South fruit garden are freely accessible. 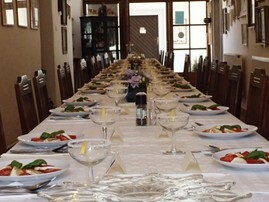 The restaurant is situated in front of the ticket office. Baby carriages are not allowed inside of the monastery. On tour with a czech commentary can be lent a foreign language text (English, German or French). The admission fee for lending is 20 Kč / 1 €. The parking lot for cars is right in front of the main entrance of the Kladruby monastery. The Kladruby monastery is wheelchair accessible. Public toilets on the compound are not wheelchair accessible. We offer barrier - free tours that contain most important interiors and exhibitions of the monastery. Pets are not allowed inside of interiors and exhibitions of the monastery. On courtyards and in gardens are pets allowed only on leash. Cycling on compound is not allowed. Bike racks are in front of the main entrance. 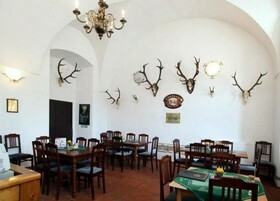 The restaurant is inside the main entrance of the Kladruby monastery. Opening hours are coincident with opening hours of the Kladruby monastery.